It was another incredibly busy outstation week, spending nights at four different locations in China and ended up now in Hong Kong airport waiting to board a plane back home. Despite the busy schedule, I bought into a stock listed in Australia this week. Few months ago, I received a tip off and spotted an excellent opportunity to own a part of a wonderful company. The stock is Coca Cola Amatil (CCA) listed in Australian stock exchange (ASX). Over the past one year, CCA shares plunged from A$15.43 to as low as A$9.06. This is more than 50% drop in price. The main reasons causing the share plunged will be discussed, as you read on. Before we take an in-depth look into CCA, let us first review its US-based parent company Coca Cola Company who owned 30% of it. Coca-Cola Company is one of Warren Buffett’s favourite stocks. In 1988, Buffett began buying stock in Coca Cola, eventually purchasing up to 7% of the company for US$1.02 bil. It would turn out to be one of Berkshire's most lucrative investments, and one which it still holds. Today Berkshire Hathaway owns 9.1% stake of Coca Cola worth around US$16.5 bil, making it the biggest shareholder of the company. Just why did Warren Buffett like Coca Cola so much? The answer is simple. Coca Cola is an iconic beverage brand of more than hundred years, with its products sold over 200 countries that let it enjoys economies of scale and competitive edge against any new entrants. It is a low-end non-luxury product consumed almost anytime that makes it near recession proof. 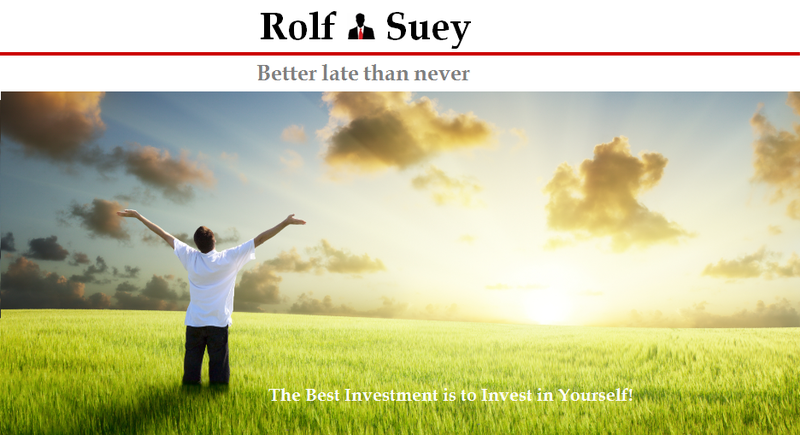 The business is almost a no-brainer and it takes seriously foolish mistakes to make it unprofitable. Its earnings had been growing for decades over decades. If you own just one $40 share (~$550 inflation incl.) of Coca Cola in 1919, with dividend reinvested, it would be worth ~$9.8mil in 2012. Coca-Cola Amatil (CCA) is the exclusive bottler for US-based Coca-Cola and related brands operating in Australia, New Zealand, Indonesia, Papua New Guinea (PNG), Fiji and Samoa. With a market capitalisation of over A$9.3 billion, CCA is one of Australia’s ‘Top-30’ listed companies. CCA’s businesses include both non-alcoholic and alcoholic segments with subsidiaries SPC Ardmona and Goulburn Valley operating in the food sector. CCA poor results last year led to recent change in CEO and the entire business is undergoing restructuring now. Since then, CCA credit rating had been lowered by both Moody’s (outlook changed from stable to negative) and S&P (A- to BBB+). Why the poor performances? CCA subsidiary SPC Ardmona, in food industry faces intense competitions from influx of cheap imported products due to rising AUD. Following the completion of the Company’s asset impairment testing process, a decision has been taken to write down the carrying value of SPCA by $404.0 million (non-cash). This includes the write off of the remaining goodwill of $277.0 million, a $39.7 million write down in the value of brand names and an $87.3 million charge covering write downs in inventory and property, plant & equipment and recognition of the diminution in value of some onerous contracts. As a result, net profits of CCA reduced from A$457.8MM in FY2012 to A$79.9MM in FY13. Another reason for falling earnings comes from pricing pressures of key competitors such as Schweppes as well as supermarket giants Woolworths Limited (ASX: WOW) and Wesfarmers Ltd (ASX: WES), who had been slashing their prices to gain market share. Spending environment continues to be soft in Australia where CCA derives most of its revenues from. Lower economic activity caused by falling commodity prices, reduced mining and increase in unemployment levels in Papua New Guinea also led to low consumer spending. Despite all the setbacks, the company financial fundamental is strong. Excluding write off from SPC, Net PAT actually increases from A$502.8mil in 2013 compare to A$457.8mil a year ago. CCA also display strong EPS growth in the last 10 years maintaining gross margin at 44 to 47%. 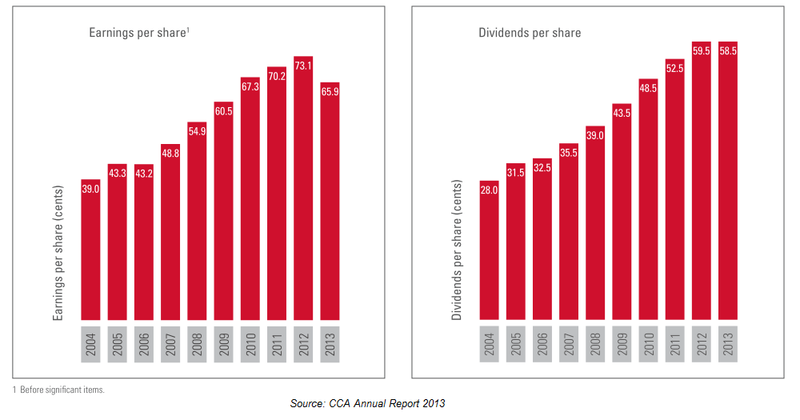 Just like many other great companies, CCA manage to increase/maintain the dividend per share yoy from A$0.28 (FY04) to A$0.59 (FY13). The dividend paid out last year also translates to an attractive yield of ~6% based on current share price. The SPCA write downs are largely non-cash in nature and have minimal impact on operations, cashflow or the ability of CCA to pay dividends. The liquidity of the company is very strong, with operating cashflow of A$733.1mil and free cashflow of A$341.6mil. Cash and equivalent is also healthy at A$1.4bil. In terms of debts, out of A$3.1bil, A$2.3bil is fixed rate. Overall borrowing rate is 4% with no refinancing required till 2016. EBIT/Interest cover is also very strong at 6.7x. Trailing P/E excluding write-off is approx.14, which pales in comparison to other Coca-Cola bottlers such as Arca Continental (22), Coca Cola HBC (30), Coca Cola Icecek (26) whose average PE is 26 and all with dividend yield of less than 2%. P/E range for the past 10 years is 12-24, so at current price CCA is at the low-end of their range. Sales in Indonesia had increased by more than 60% since 2008. If not for Rupiah depreciation, Indonesia also recorded earnings growth last year. CCA’s Australian beverage business accounts for around 70% of the group’s overall earning, but note that Indonesia has a population of 250 million, which is 10x that of Australia. By statistics, the average Indonesian only drink 14 Coke products per year compare to more than 250 Coke products for Australians and more than 400 for Americans in a year. The growing middle-class in this developing country is quite certain to bring about favourable results in the long run for CCA earnings. Indonesia is expected to again deliver volume growth of over 10% this year. CCA had re-entered into the beer market last year, with a 50% JV with Australian Beer Company. From a market report, Australian beer market is worth up to US$11bil in potential sales and up to US$1bil in profits annually. While it will be distributing brands such as Carling, Coors Light and Cobra, it is anticipated that CCA will grasp the third spot in Australia beer market share which should boost earnings for years to come. The stock price is trading just above its lowest level since after the GFC. This offers an excellent opportunity to own a part of Warren’s Buffett favourite business. Needing no explanation, Coca Cola brand is world renowned with non-cyclical business nature that is almost recession proof. With high barriers of entry and a durable competitive advantages I am quite sure it can withstand the test of time. Yet, it must be noted that CCA will continue to see temporary weakness in its business while undergoing restructuring process. The situation of competitive pressures, wobbly post-election outlook in Indonesia and a struggle SPC Ardmona division is unlikely to improve short term business outlook. In the long term, I am quite certain the restructuring process will improve productivity and reduce costs thereby increase earnings. I had already gone through the hassle to open my ASX trading account to own part of Coca Cola! How about you? Hi, there seems to be an ADR for it. You can use USD to buy instead. Thanks for the comment. Another new thing I learn. ADR = American Deposit Receipt. Normally I will do it for counters listed in UK. No point changing so many currencies. US dollar is a popular currency for investing different countries' stocks! Thanks for your blog. However do take note as this is ADR, they could be 15% taxed on dividends. I also added this stock in my dividend portfolio. Good choice. Quite sure it is not gonna disappoint over long term. 20 years from now, I am quite sure I will still be drinking Coke! May I know if you opened a trading account with ASX in Australia or you are trading using Singapore brokers? I am trading using my local platform Lim and Tan. Please contact your broker, they should be able to advise and then provide you some forms to fill up. Note that my broker do charges a per month fee for maintaining ASX platform. Few bucks per month I think.